Have you seen Mediterranean fruit fly symptoms? In Queensland, Mediterranean fruit fly (Ceratitis capitata)is listed as prohibited matter under the Biosecurity Act 2014. Be on the lookout for these symptoms and report them to Biosecurity Queensland. Early detection and reporting of symptoms are the key elements in controlling the pest. 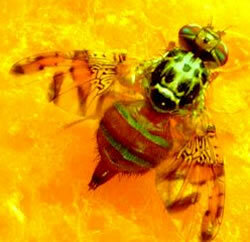 Mediterranean fruit fly [Medfly] (Ceratitis capitata) is one of the world's most destructive agricultural pests. It can infest over 200 fruit and vegetable varieties and is particularly damaging to stone fruit such as apricots, peaches and nectarines; pome fruit such as apples and pears; citrus; and guava. The female Medfly attacks ripening fruit, piercing and laying eggs under the soft skin. The eggs hatch into larvae (maggots), which feed inside the fruit, making it unfit to eat. Medfly originated in Africa and has spread throughout the Mediterranean region, southern Europe, the Middle East, South and Central America, and parts of the United States, including Hawaii. In general, it is now found in most tropical and subtropical areas of the world. In Australia, it was first detected in Western Australia in 1895 and still exists in the south-west of that state. It had spread to the eastern states by 1909 but had disappeared from those areas by 1940, possibly because it could not compete with the Queensland fruit fly. Occasional outbreaks continue to occur outside the south-west of Western Australia, particularly in South Australia, which has a suitable habitat and widespread planting of favoured hosts such as stonefruit and citrus. Despite doubts about Medfly's ability to compete with the Queensland fruit fly, Queensland is still at risk. An outbreak of the pest could be devastating to fruit and vegetable industries, causing severe disruption to the marketing of host crops due to the quarantine restrictions imposed by importing states and countries. Production losses would occur and use of chemical treatments would increase production costs. The adult fly is 3-5 mm long, slightly smaller than a housefly. The thorax (back) is mottled with shiny and dull black and yellowish-white areas, and the abdomen is yellowish to brown with two pale cross bands. The wings are patterned with yellow, brown and black spots and bands. The female lays about 300-400 eggs during her 6-week lifespan, which hatch into white maggots that feed on and destroy host fruit. When fully developed, the maggot drops to the ground to pupate in the soil and transform into the adult stage. The new adults emerge from the ground to continue the life cycle, which can be completed in 21-30 days during summer months, but can take considerably longer in cooler conditions. Medfly causes typical fruit fly damage to a range of fruits and vegetables. That is, the female fruit fly stings fruit to lay eggs under the skin, from which larvae (maggots) hatch and tunnel through the flesh causing premature ripening and rotting. Medfly could spread to Queensland in infested fruit. To prevent this, quarantine restrictions apply to the entry of Medfly host fruit from infested overseas countries and Western Australia, under the Biosecurity Regulation 2016. In addition, Biosecurity Queensland monitors key, high areas for fruit flies throughout the state via its Exotic Fruit Fly Trapping program. This program ensures that pests are detected early enough to implement an eradication response.